Aside | This entry was posted in Interiors. Bookmark the permalink. 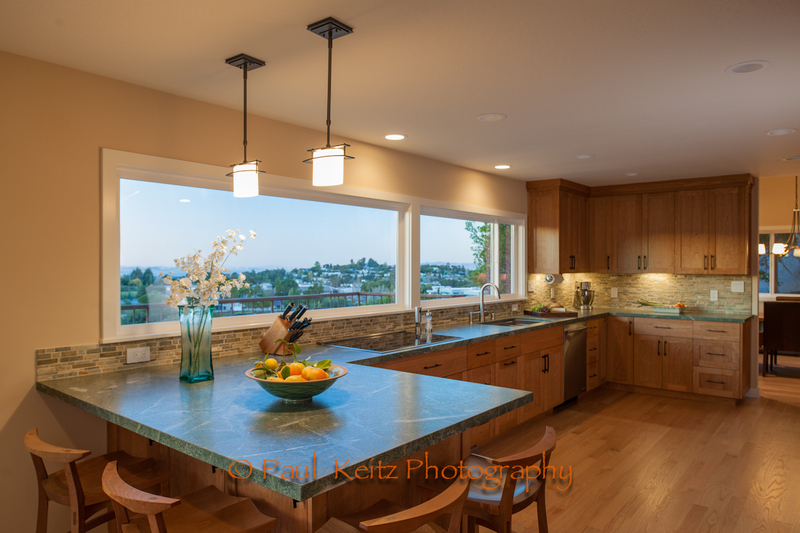 The kitche remodel should be featured in Sunset magazine. Thanks Di! Totally Sunset Magazine. It’s one of the “models” that I consider when I’m viewing a space that I’m planning to photograph. Your picture makes the kitchen totally desirable. Soft tones and the best view. Great way to capture the view through the window. The kitchen is totally desirable! The view was incredible. Paul what a fantastic picture. You really have captured all the kitchen and great move to use the tools around you such as nature to your advantage. Also good to see your being rewarded and recognized for your immense talent. Thanks for your generous comments H! SEA, Katja and Petalyn really deserve the credit for creating such a terrific space to photograph. The irony is that I know the owners and had recommended Katja and SEA Construction to them for the remodel! This was before I started doing photography for SEA. One of the pleasantly, strange twists of running a small local business. What’s not really in the pictures are the small flash units that I used to “fill” the kitchen with to lighten the shadows under the cabinet/chairs and the center cabinets. The effect looks pretty natural to my eye just a slight highlight on the ceiling. I didn’t get to assist you on this one but certainly, I have tremendous fun with you on these shoots. Thank you for recommending Katja and SEA for this job. Let’s do that interview. I’m doing a press release about the regional award and would love a few quotes from you. Likewise, I’ve enjoyed the shoots when we’ve worked together. I’ve learned a lot from you about crafting a story with photographs for a house or a room – your story board approach. I think with the SF Victorian remodel, we really nailed it. It took a 700 pictures but then again there always seemed to be one more floor in that house!